After yesterday’s strong winds and no visibility it was wonderful to have amazing views and light winds. 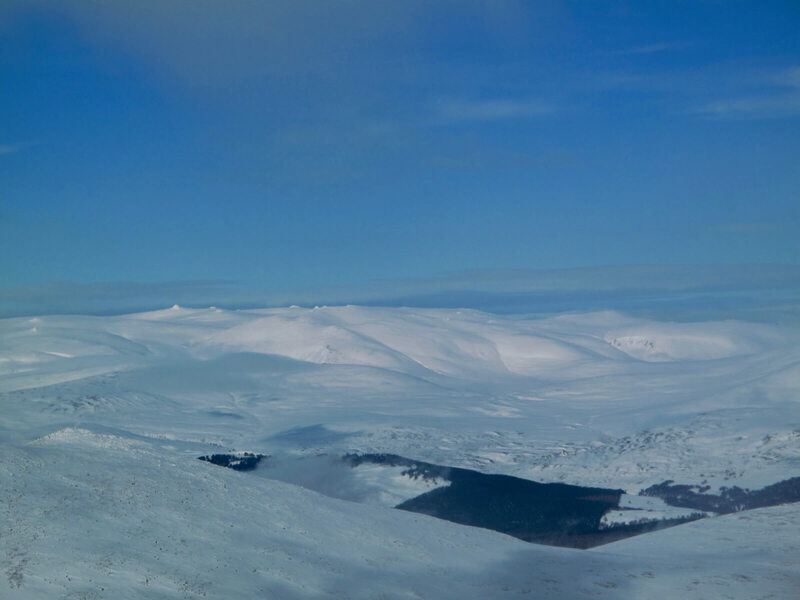 The snow cover is absolutely amazing with snow right down into the glens – if you are a keen ski tourer the options at the moment are extensive. 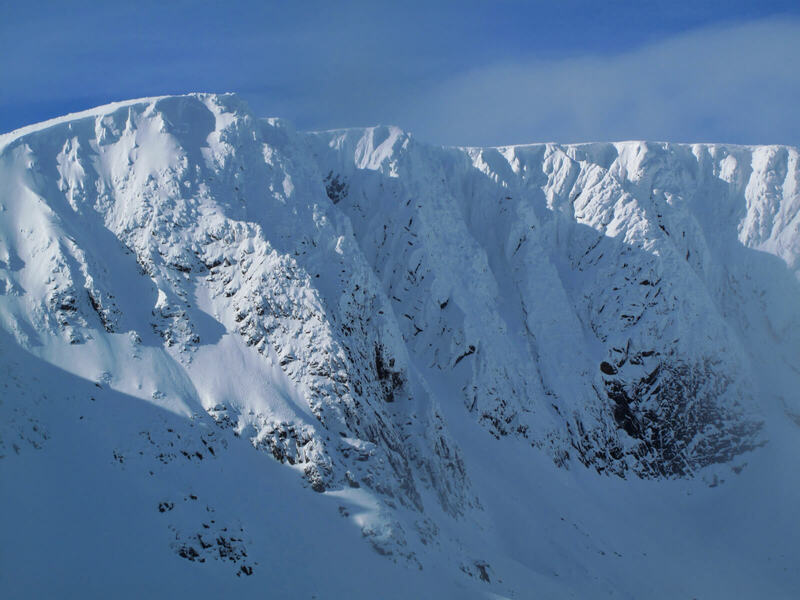 It became obvious fairly quickly that nobody had been into Lochnagar recently and much applause needs to go to the three young climbers who broke trail for most of the way in with full climbing sacks. 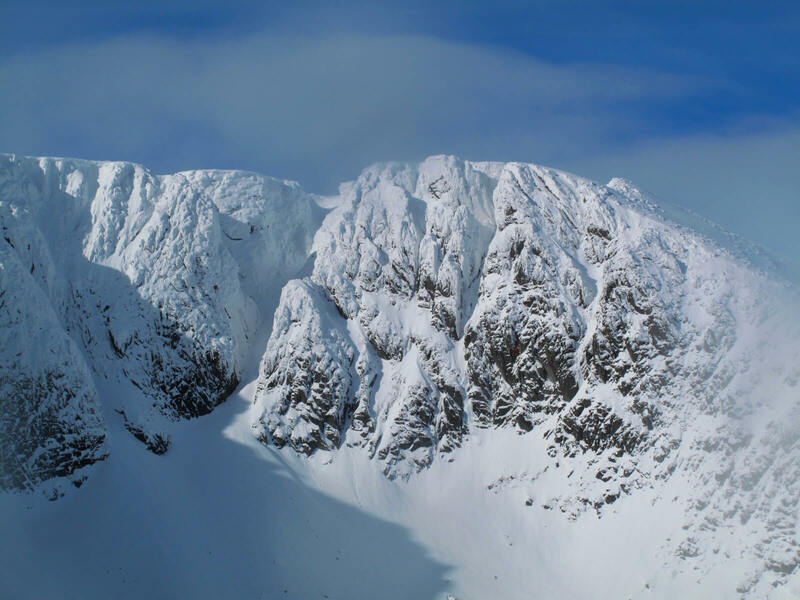 Also to the pair of climbers who walked in from Gelder Shiel, breaking trail all the way – hard work at the moment! The air temperature rose a little earlier and went a little higher than expected – which was actually a positive thing as it has helped to consolidate the recent accumulations. 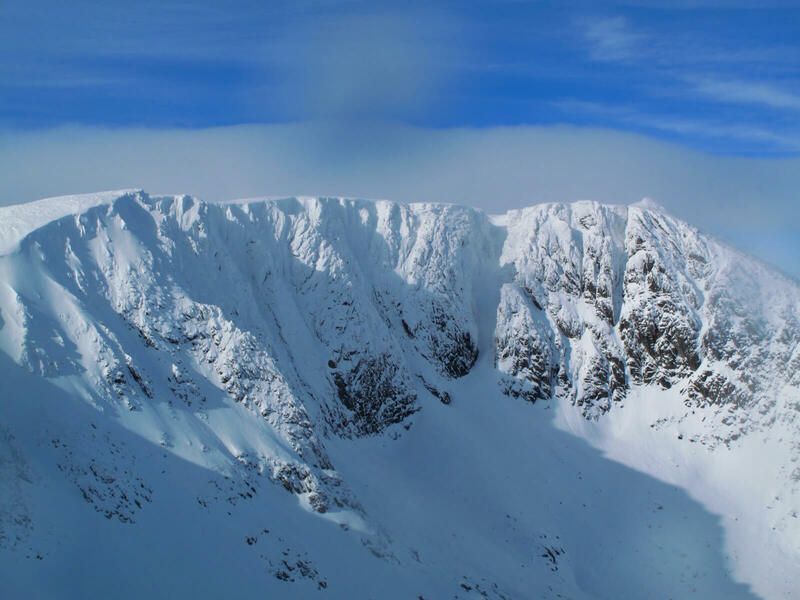 We’ve just been sent a photo by Nick (BMRT) of an avalanche in Coire Fionn, Glas Maol that was receiving a lot of drifted snow into it yesterday. Light winds expected again tomorrow – but there might be more in the way of cloud around. Cooling down a little so some of the snow will start to firm up a bit. Avalanche debris in Coire Fionn, Glas Maol. Thanks to Nick from BMRT for the photo. 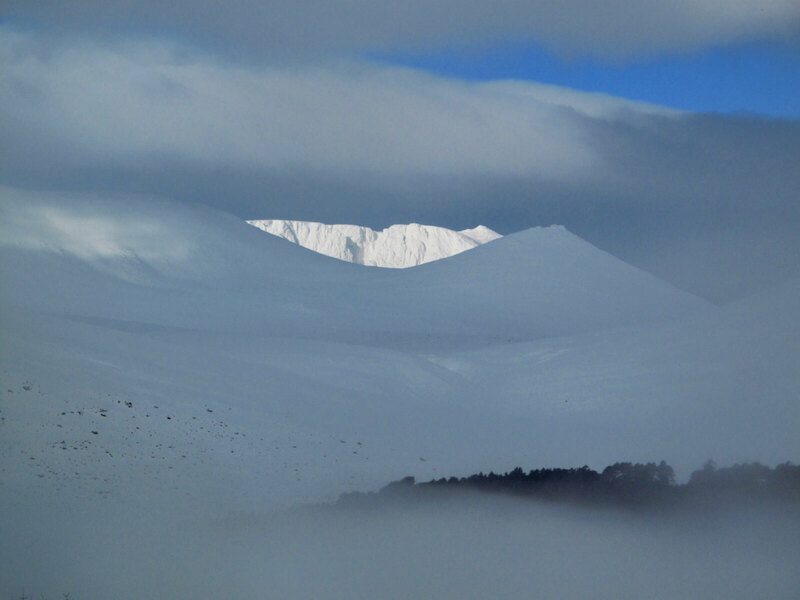 Snowy Lochnagar, full cover on the apron and over the loch. Looking into the Southern Sector. 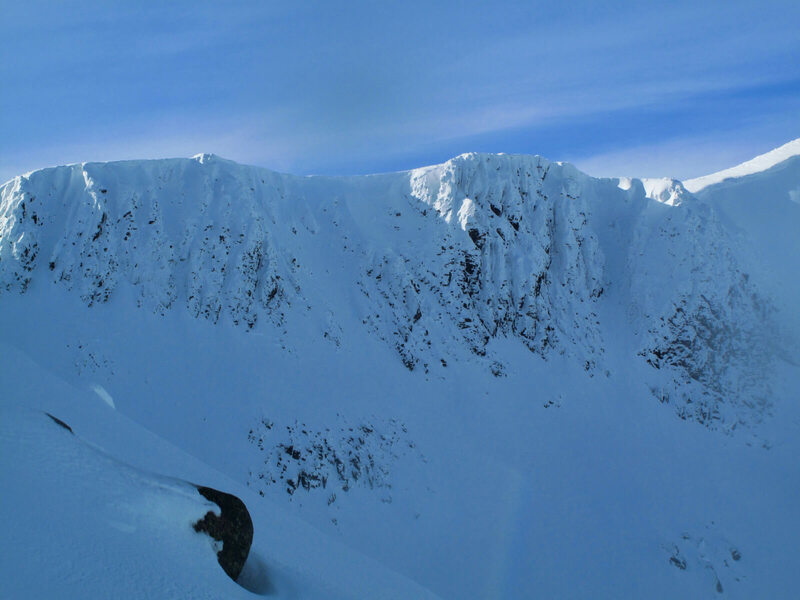 Strong persist Easterly winds have helped to strip the cornices back a little. Strong sunlight catching the West Buttress. Blue skies over towards Ben Avon. Amazing morning light catching the cliffs with low cloud in the glen. Hi, Fantastic reports as ever. 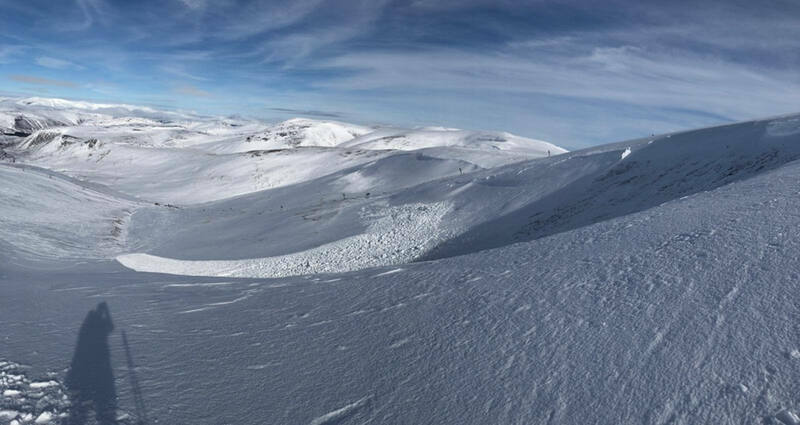 Skiing at Glen Shee but stayed to the West of the road as everybody went to Glas Moel side, but spotted massive avalanche in Garbh-Choire, immediately West of the Summit of Cairn o’ Claise. The whole Corrie had slid! Hi Callum – Thanks for that – it looks like Saturday evening/night was quite an active period. If you could report it on the SAIS home page (bottom left) that would be really useful – just fill in whatever information you can – don’t worry if you can’t full in everything – We will get over to it as soon as we get some visibility.